Contemporary Controls’ new BAScontrol20 is a cost-effective BACnet/IP controller that provides a useful mix of eight universal inputs, four binary inputs, four binary outputs and four analog outputs. Models exist for both triac and relay binary outputs. The device is ideal for unitary control or for expanding I/O points in the field via an Ethernet connection. The BAScontrol20 utilizes a powerful 32-bit ARM7 processor with 512 kB of flash memory plus a 16 Mbit serial flash file system for storing configuration data and an application program. By operating at the BACnet/IP level, the BAScontrol20 can share the same Ethernet network with supervisory controllers and operator workstations. The unit can be configured for a fixed IP address or can operate as a DHCP client receiving its IP address from a DHCP server. A real-time clock with a super-cap backup allows for creating local schedules. The BAScontrol20 is ideally suited for structured wiring systems and is BACnet/IP compliant with a B-ASC device profile. Distech Controls has launched its latest ECL-PTU & ECB-PTU Series of LONWORKS and BACnet programmable controllers. As an advanced and efficient solution for addressing any terminal control application, these new easy to configure controllers offer system integrators and end-users greater flexibility and lower cost in building management system (BMS) applications. ECL-PTU & ECB-PTU controllers, as well as ECL-VAV & ECB-VAV, are expandable with lighting and sunblind modules (ECx-Light and ECx-Blind), capable of controlling up to eight lights and eight sunblinds at a time. This Integrated Room Control Solution allows occupants to adjust temperature, lighting and sunblind settings in the room to achieve a level of personalised comfort. In addition, the automation of lighting and sunblind levels based on indoor and outdoor light levels allows occupants to benefit from increased natural light. For more information visit http://www.distech-controls.com. Featuring a large contact area, the TT-359 offers an accurate and reliable solution for measuring pipework temperature without the need for drilling holes or using pockets. This new range is perfect for pipe and ductwork in tight locations where standard probes with housings will not fit. The 150mm probe can be used with either a stainless steel pocket (TT-PO) in pipework or a duct flange plate (TT-DFP) in ductwork. Temperature measurement for comfort can be best achieved by taking into account the radiant effect of surfaces within the controlled space. The comfort temperature is specified as the average of the conductive temperature and the radiant temperature. Belimo extends its Electronic Pressure Independent Valve (ePIV) range from 6” down to ½”. The ePIV is a 2-way pressure independent characterized control valve with an integrated electronic flow meter and a powerful control algorithm. The ePIV maintains flow set point regardless of differential pressure variations. It achieves this with its powerful algorithm that modulates the valve based on its measured True Flow. Statistics suggest that most sensitive facilities, such as IT facilities, server rooms, retail spaces, offices, libraries, museums, and even industrial sites, WILL experience damage or work stoppage at some point over their lives due to a fluid leak. RLE’s successor to the wildly popular SeaHawk LD300, the LD310 has all the bases covered to assure your facility is protected. With both audible and visual alarms, the LD310 is the perfect small area leak watchdog. When a leak is detected along the length of an attached Leak Detection Cable or spot detector, the LD310 will set off a loud beep as well as a flashing LED light notifying your staff that corrective action is needed. Thomson Industries, Inc., a leading manufacturer of mechanical motion control solutions, introduces the new PC Series, a new generation of precision, electric linear actuators for continuous duty applications. They offer the highest power density of any actuator in its class. The compact, efficient design enables machine builders clear advantages over traditional pneumatic linear actuators including simpler machine designs, lower maintenance, higher overall performance and substantially lower energy costs. The PowerScout 24 is an all-new multi-channel power meter which replaces the PowerScout 18. The PowerScout 24 offers the lowest-cost per meter point versus comparable industrial multi-channel power meters. 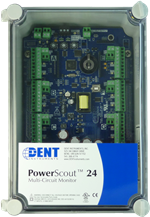 The modular design of the PowerScout 24 allows it to be configured for monitoring multiple electrical circuits or for current-only monitoring of branch circuits. There are virtually no restrictions in “mixing & matching” current transformers on the PowerScout 24 and any combination of CTs can be used. Our VT8000 product line which provides the perfect combination of energy savings and comfort. Our customers quickly realised that beneath its sleek modern exterior lay a sophisticated room controller offering flexibility and advanced energy saving strategies without sacrificing user comfort. The VT8000 provides all the great functionality, comfort, and energy savings you’d expect from a modern controller with the added flexibility to choose even more great customizable options. Tiny form factor delivers unprecedented installation flexibility; ideal for mass deployment across office buildings, college campuses, hotels, multiple dwelling units, and convention centers. The Crestron RMC3 is an ultra-compact, cost-effective 3-Series Control System® designed to provide control and monitoring for a single display device, AV system, lighting and shading, climate control, security, energy management, and many other specialized applications.